Despite the fact that I am a huge fan of Asian cuisine, I usually leave the dim sum and fried rice to the experts. Why cook at home when you can eat affordably at a plethora of Asian restaurants in China Town, or consume endless parcels of deliciousness at Ping Pong? My attitude soon changed when I discovered the School of Wok – a cookery school teaching the art of Asian and Oriental Cuisine. Located in the heart of Covent Garden, the school is just a stone’s throw away from bustling Chinatown where the chefs source most of their ingredients. The School of Wok offers a wide range of classes covering many cuisines including Chinese, Indian, Thai, Japanese and Vietnamese. Catering for the beginner to the more advanced, the School of Wok is perfect for anyone seeking to improve their cooking techniques or learn a new skill. I decided to pick the cuisine I was most uncomfortable with, which also turned out to be one of the most challenging – the “Dim Sum Masterclass”. The owner and head chef, Jeremy Pang, started the School of Wok in 2009 as a mobile cookery school specializing in teaching people to cook in their own homes. Opening in Covent Garden in May this year, it’s now one of the leading Asian cookery schools in London. Being raised by a generation of foodies, Pang has an infectious passion for food and was the perfect host for the evening being both educational and entertaining, bringing fun and good humour to the table. 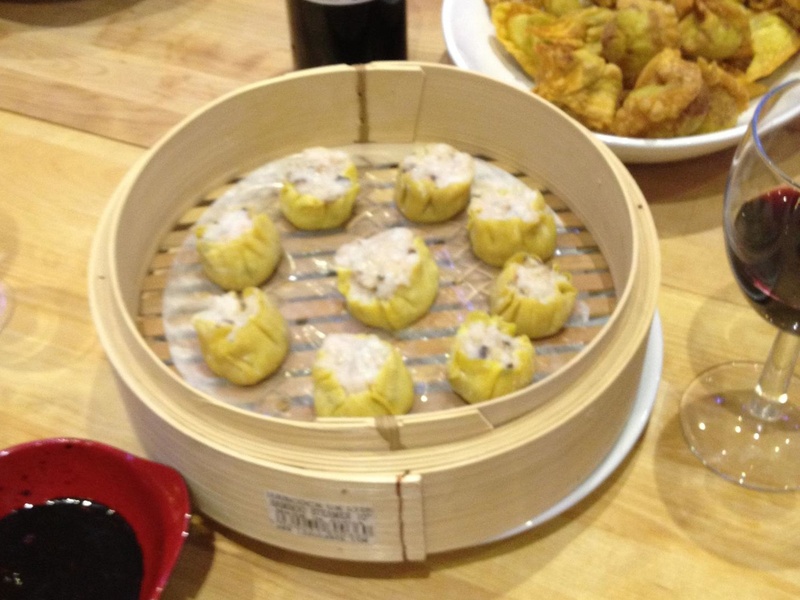 The three-hour evening class had a packed schedule, focusing on four varieties of dim sum. Most of the preparation and slicing and dicing was done for us so we had more time to concentrate on the important stuff – the technique. We started with the char siu (BBQ pork puffs), which was a perfect introduction to dim sum wrapping. Small teaspoons of the pre-prepared belly pork filling, marinated in a bath of sweet and salty flavours, were placed in squares of puff pasty, folded delicately then glazed with egg and sesame seeds. Next was the black bean rib, freshly bought from Chinatown, which we marinated in a bed of rich flavours including soy sauce and rice wine. Pang offers useful tips throughout the evening and explains that adding black beans while marinating rather when steaming, gives the beef a more distinct flavour. 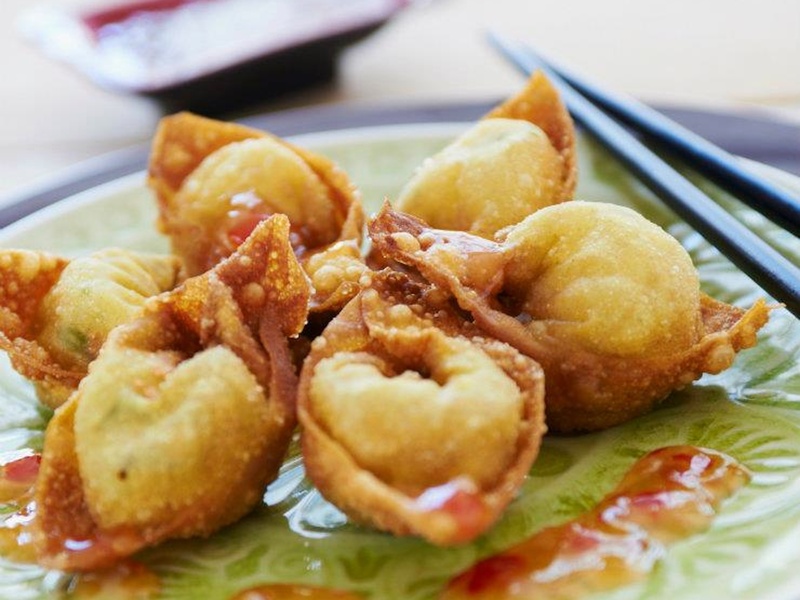 The crispy wontons were prepared with a filling of tiger prawn paste, a selection of fresh Chinese herbs and a generous lashing of light soy sauce, salt and sesame oil. 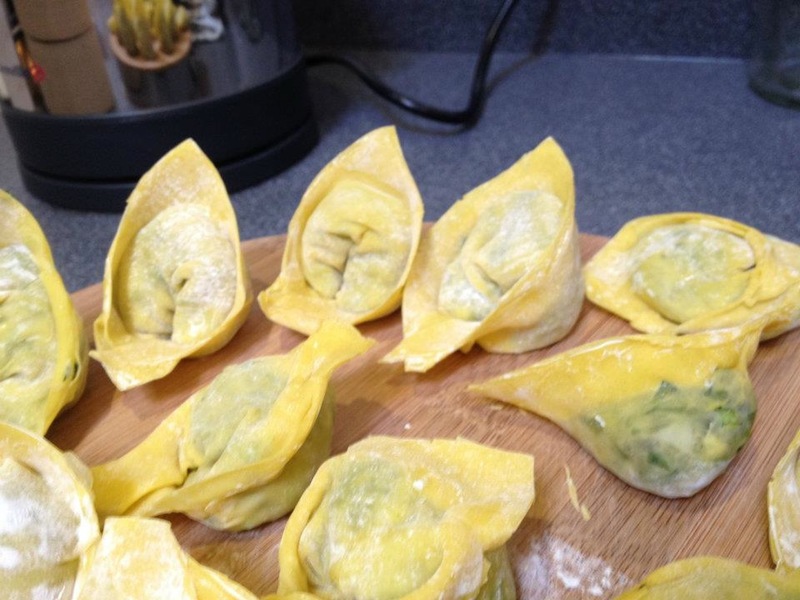 We then had a chance to practice our wrapping techniques with the wonton pastries in preparation for the next dish. The dish of the night, (also the trickiest!) without a doubt, was the har gau (crystal prawn dumplings), which took an hour and a half of careful and often painstaking handcrafting to prepare. The pastry was comprised of a surprising mix of wheat starch, tapioca flour, boiling water and lard. We had the chance to master the technique by making two batches of pastry. It was quite the process; kneading the pastry quickly while it was still warm to keep its elasticity, rolling each pastry into a symmetrical circle (not as simple as it sounds) and the most difficult – the wrapping. During the class we learned a number of different wrapping techniques. “It is important not to be heavy handed while wrapping since it ruins the shape of the dim sum” Pang explains. After several attempts (and fails) I finally got the folding technique right and the ‘sad goldfish’ shape result. The great thing about Pang, he makes you feel completely comfortable with his honest practicality and his real desire to help people. My stomach was starting to rumble so I was delighted to hear that we had successfully completed all the dishes and now it was cooking time! Pang and the team placed the wontons in the deep fryer, the BBQ pork puffs in the oven and the har gau and black beans ribs in the steamer. And the best thing? We could enjoy our own food at the end with the team over a glass of wine. I was rather impressed with what I had achieved. The BBQ pork puffs were delicious, with a soft outer crust and a sweet spicy centre. The har gau, my personal favourite had a lovely texture and combination of flavours. 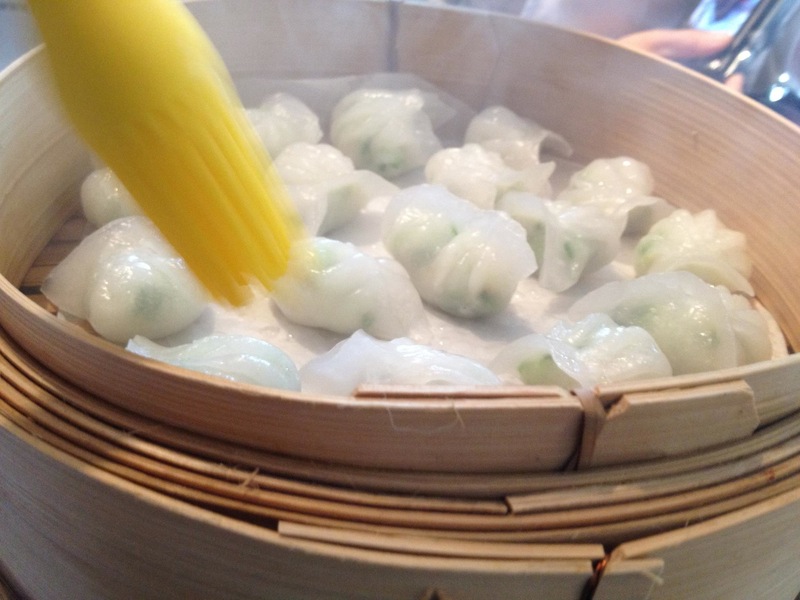 The pastry even achieved the translucent appearance required of crystal dumplings. Let’s just say I will appreciate the work behind dim sum next time I eat it. It’s definitely an art which takes a while to master but I can’t wait to get in to the kitchen and try this delicacy again. Classes at the School of Wok start from £45 for a quick fire one-hour class. Looks WOW! Thanks for sharing this. I love wok and am looking for best wok to buy.